I finished Pair #3 of 2012, yaaaaaaaaaaaaaaaaaaaaaaaay! 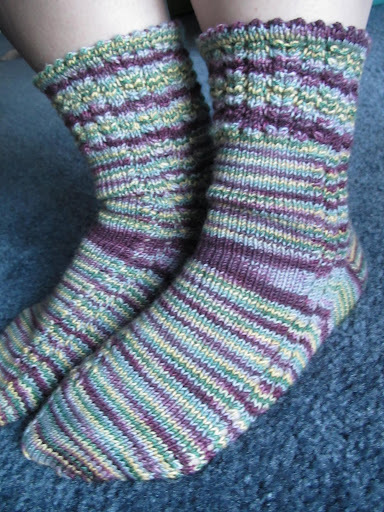 These are Cotty socks designed by Irishgirlieknits in STR Mediumweight, colorway Scottish Highlands. This is one of the first skeins of STR I bought for myself (two years ago in April 2010!) and I’m so pleased with how it knit up. I really enjoyed this pattern. It’s simple and pretty, with nice easy lace and a lovely picot hem. I highly recommend it! 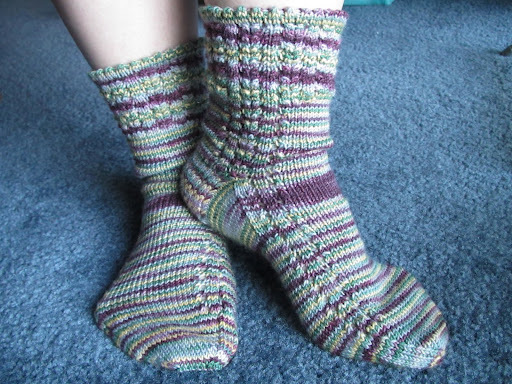 * I named this project Scotty, because Scottish Highlands + Cotty Socks = Scotty. Superclever!!! This entry was posted in FO, STR by shoelaceswitcher. Bookmark the permalink. I was in Scotland last summer, and that colorway is very accurate. I love the pattern too btw, I think it made you a pair of beautiful socks. Thank you! I am super jealous that you've been to Scotland. It's near the top of my pie-in-the-sky travel wishlist.